Arthur A. Levine Books, 9780545244664, 32pp. The Dinosaur Tooth Fairy lives in the Museum, where she polishes her giant tooth collection and remembers the good old days. But when a little girl with a loose tooth walks through with her class, the D.T.F. knows she wants it, wants it, WANTS it! The thing is, the world has changed quite a lot since the D.T.F. was out and about -- there are doorknobs, slobbering dogs, and school buses to worry about now. Not to mention a mysterious Tooth Fairy rival who might just sweep in and ruin everything! Here is a story about loose teeth, heart's desires and -- in the end -- friendship, that is both laugh-out-loud funny and unexpectedly touching. 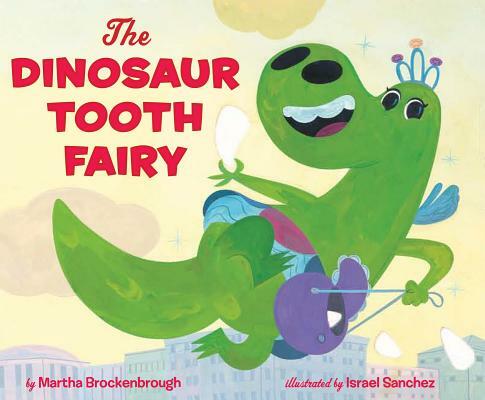 This is the T-Rex of tooth fairy books. (Or maybe the most magical tooth fairy of dinosaur books?) Read it and teethe.